The NoPhone is exactly that, a plain black plastic rectangle about the size of a smartphone that was created as a Kickstarter project for people who are "addicted to rectangular devices." It has a thin, light, and "completely wireless" design, and provides a "technology-free alternative to constant hand-to-phone contact," so you can stay connected with the real world. This is the brainstorm of a group of friends from the United States and the Netherlands, reacting to the omnipresent glowing screens seen in any group of people. Their idea was that the NoPhone could provide the comforting feel of a phone shape in your hand, while still encouraging "a life of direct eye contact and improved conversational skills." The original NoPhone, now available for $10, has phone-like indents in the surface to provide tactile comfort with the suggestion of controls. You also can get it with the "selfie upgrade" -- a reflective mirror sticker -- for $15. 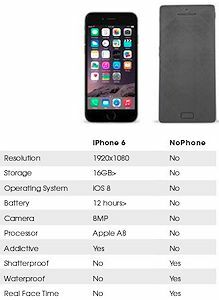 And now there's the NoPhone Zero -- "the least advanced NoPhone ever," with exactly zero features (yes, it's just a plain black slab) -- available for $5. It's positioned as a downgrade from the original NoPhone, with "no buttons, no logos and most importantly no phone." And, of course, the NoPhone has no warranty and, "is not intended to be used for anything." So you can pick up a NoPhone for yourself, or as an intervention for friends and family -- It's also available in multi-packs. Yes, Programming Languages ABC++ is a toddler's ABC board book -- It indeed features a different programming language for each letter (although C++ actually is not one of the languages). The book obviously is not intended to actually teach toddlers to write code, but it is a fun way for software developers to share a little of what they do with kids. Each letter features information about the associated language and "Hello World" sample code, plus a playful "bug" cartoon that illustrates a "normal" word for the letter (S for spaghetti, P for python snake...). This is a one-off Kickstarter project from Alex Papadimoulis, whose day job is running Inedo, a small software development company, and who also hosts the popular software blog, The Daily WTF. Inedo has kindly posted a free copy of all the pages of the book online, so you can check out your favorite letters before getting the book. 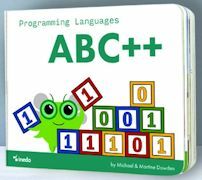 The Programming Languages ABC++ board book is available for $11.95 for your enjoyment, or even to share with kids. You also can find associated ABC++ "bug" posters, coloring books, and T-shirts. TYLT has expanded its product line of batteries, chargers, and other mobile accessories by using Indiegogo to crowdfund a new and larger TYLT ENERGI Desktop Charging Station. This is a desktop hub that plugs into the wall with the included cable and provides 5 USB ports to charge up to five devices at a time. Four of the ports provide 2.4 Amps each (50 Watts total) for smartphones and tablets, with smart technogy that rapid charges at the maximum rate of the attached device. The fifth port is actually a removable and rechargeable 3,200 mAh battery pack that docks in the Charging Station to recharge, and then pops out to provide power on the go -- with more than one charge for a smartphone. The unit is 5 x 4.25 x 1.6 inches, and even is designed with a wrap-around cover that you can use to wrap and organize longer cables. The TYLT ENERGI Desktop Charging Station is available for $79 to $99. Entries posted to Manifest Tech Blog in January 2016, listed from oldest to newest.